Landmark NGT Ruling for Government Agencies: Deconcretize Trees or Go To Jail! 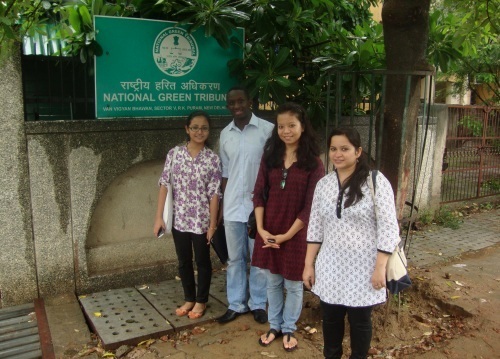 All roads led to the Hon’ble National Green Tribunal (NGT) today morning as the Court remained full of environmental activists, environmental journalists and lawyers representing various public and private agencies. The proceedings of the Hon’ble NGT were like music to the ears of anyone concerned for protecting the environment since all the green wrongdoing was being highlighted and quashed. Among several cases like the ones exposing fraudulent Environmental Impact Assessment reports, clearing of waste from the Delhi Ridge etc, the case of deconcretisation of Delhi trees was also taken up today. The case (filed by Aditya Prasad & others) has been filed against all civic administration agencies in Delhi and Delhi Greens has been asking all citizens to sign a petition for urging the NGT for immediate deconcretisation of the Delhi trees [Click on link to sign the petition if you haven’t so far]. Representatives from most civic agencies (NDMC, PWD, DDA, all municipal agencies) were present in front of the Hon’ble bench but could not impress anyone include the onlookers! The constant non-willingness of these public agencies to deconcretize the Delhi trees was met with mockery and strictness by the Hon’ble NGT bench. Repeated arguments by the lawyers of all these agencies were silenced by the Court by simply asking if any of the agency could name a SINGLE COLONY IN DELHI where all the trees have been deconcretized. As all the lawyers remained silent and without answer, Hon’ble Justice Swantanter Kumar himself answered it “with a BIG NO”. It came as a bigger surprise when agencies wanted more than six months to complete the deconcretisation work in their jurisdiction which only highlighted the lack of sense of duty. This was duly noted by the Hon’ble bench which felt sorry that a work which is the responsibility public agencies has to be gotten done through Court orders. The high point of the hearing remained the time when Hon’ble Justice Swatanter Kumar challenged all the agencies to any one colony in Delhi where deconcretisation was complete and be ready to go to jail if he finds a concretised tree there. The Hon’ble NGT Bench and all the citizens attending the hearing were also amused by the fact brought out by the petitioner Aditya Prasad, that the same trees are being concretized and deconcretized again and again through Court orders. The role of contractors in trying to make extra money by concretizing pavements as much as they can as well as carefree supervising officers in the Government was prominently highlighted in threatening the trees. The conclusion of the hearing perhaps motivated by the aforementioned, and took all the public agencies to task. Hon’ble Justice Swantanter Kumar has now ruled that the Head of each public authority party to the case (of which there are 15 in number) has to file an affidavit identifying three colonies in the NCT of Delhi and deconcretize all trees in these colonies before the next hearing (on 8th August, 2013). This has to be made paramount activity and should be the top departmental priority of each of these agencies/departments. Further, each agency has to file a report to the Hon’ble NGT before the next hearing as to what will be the cost incurred and who is the officer(s) incharge of performing this task. The NGT also highlighted that no more concretisation of trees will now be allowed and this should form part of the contract given to those who develop the pavements in Delhi. The high point again remained the fact that if the public agencies do not comply to this order, in the words of Hon’ble Justice Swantanter Kumar, “the law will take its due course.” The trees are winning and lets keep the fight on. Be a citizen activist! Click here send us your comments, or inputs on concretized trees around your house/ workplace. The Concretization of Trees, Or That of Non-compliance?